Please note: Non-Jews who respect Jews for who we are and want Israel to be the Jewish state-this article is not about you! What is it about the scent of other people’s money that it destroys the brain cells of some of our brightest Jewish people? That it affects their moral compass and discernment? I have worked as a fundraiser for a charity. It is no easy task. When someone wants to give you money you jump on it; unless the person or organization giving that money conflicts with your agenda. It is called integrity. So why do Jewish organizations take money from places like ICEJ-the International Christian Embassy of Jerusalem? Because it comes to them-easy money. This organization has one goal-spreading the word of Jesus to the Jews. Now. Not in the world to come. But now, in Israel; the one country in the entire world where Jews should be free from these attacks against our values and beliefs after the Christian world turned a blind eye-or maybe not so blind-to the death of millions of us. Do you not think that these people who claim to love us would love us enough not to preach Jesus in Israel? They teach their representatives in the 70 plus chapters around the world to befriend the Jewish people; get involved in their work. The President of ICEJ in Canada is very successful. I know this from personal experience. I have been removed from two Jewish organizations because of a conflict-my refusal to be part of an organization that takes money from ICEJ- and have been shunned by others. Dr. George Giacumakis, the one-time Chairman of the Board of Trustees of ICEJ, has said straight out that it is hoped, through various ‘friendship’ organizations with Jews, and by giving financial and political support to Israel, that Jews will start showing interest in Christianity. ICEJ writes: “The Jewish world must know that the call to be obedient to world missions, including the Jewish world, is not a small matter that can be compromised. No, this call is a major tenet of our biblical faith” (Romans 1:16; Matthew 28:18-20). ICEJ works with organizations, like KKCJ, whose sole purpose it to plant seeds in Israel-churches-that call out to the Jewish people; that promote Jews for Jesus, throughout the land. They are building them now. For the present. Not the world to come. Please watch this video. Wayne Hilsden, from KKCJ and an ICEJ board member, attended a conference sponsored by ICEJ. He talks about their plans for ISRAEL. They intend to share the Messiah’s love. And they are developing Hebrew speaking congregations to do this. They want to help us by bringing the teaching of Jesus to the land. I implore you to read the statements on line and discover for yourself the mission statement of this world -wide organization. It is part of a larger group who are covertly and overtly preaching Jesus to the Jews, while telling us they love us. Am Yisrael, there are 7 billion people in the world. One billion are Catholic. One Billion are Christian. There are millions of Christians, amongst others, who love us for who we are, not what we can do for them. Let us befriend these people. We must stop being so fearful that we accept help-with strings attached. The enemy of my enemy usually turns out to be my enemy. History records that every time we look outward for help, rely on others, we grieve. We have an extraordinary country with an extraordinary military and the hardest working citizens who create not just for Israel and the Jewish people-but for people all over the world who are grateful. We will suffer if we continue to fool ourselves that we can take money from these people and not have to pay back at some point-although I think we are already paying back-with more churches throughout Israel and Jews pushed aside in Jewish organizations world-wide in order to keep the ICEJ money train on track. I want to share a story with you from way back in the 1960’s. It’s called To Serve Man and it was written by Rod Serling for the Twilight Zone series. That series was cutting edge at the time and there are some stories that stay with me to today. Here’s the story as I remember it, about serving man. A group of people come from another planet and want to befriend the humans-mankind. Needless to say, the people were afraid-aliens for heaven sake! But these aliens ingratiated themselves by offering to help them in so many ways. And soon the people warmed up to them. And then the aliens invited groups of people to come on the spaceship, and go back with them to their planet. How bad could it be? After all, look how well they were treating the people of planet earth. So a group of people sign up for the expedition. All excited. And we watch them climb up the steps and into the ship off to this new planet where they have been promised that man will be served. And man was indeed served……….. baked, broiled and boiled. The aliens were honest when they said they wanted to serve man. But the people only heard what they wanted to hear. Today, the Jewish people are told by many Christian organizations that they want to serve us. They love us and want to help us. And we hear only that they care about us. We hear them say we want to serve the Jewish people. And they do. They want to serve us up to Jesus. They want to change the Jewish neshama of the land of Israel into a Christian one. 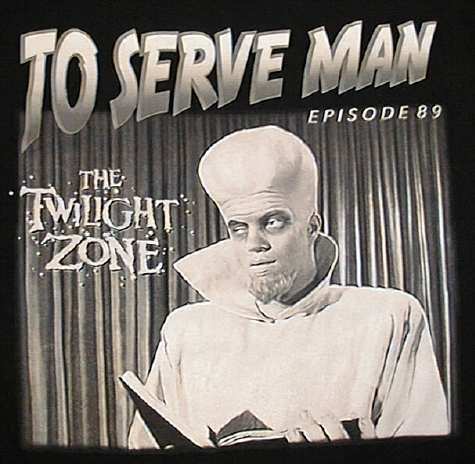 So the next time a Christian organization like ICEJ KKCJ and JIJ offer to serve us I hope you will take a step back and remember this Twilight Zone story to serve man. There are a number of major Israel-focused Christian conferences and events scheduled for 2015, several of which are to be held in Jerusalem. They all emphasize bringing Israelis to christ and empowering the messianic Christian movement. Included among these missionary happenings are REZ’s Israel Summit Stand Firm, ICEJ’s Envision Pastors and Leaders Conference , Empowered 21 Global Congress, and the Lasaunne Conference on Jewish Evangelism (LCJE). In the past, the most widely publicized evangelical events in Israel have publically downplayed the proselytizing message to the Jews and the evangelical connections with the messianic movement in Israel. Instead these events were billed as pilgrimages with an emphasis on worship as well as on expressing solidarity with the Jewish State. What has been going on inside the auditoriums is another matter. Since 2009JewishIsrael has regularly provided reports, complete with video footage, on the conversionary agenda of many of these events such as the Global Day of Prayer, Global Prayer Initiative, Elav Concerts and Sid Roth’s conversion extravaganza. Openly strives to give legitimacy and support to the Israeli messianic movement. Places an unadulterated focus on the Christ-centered message of spreading the Christian faith to the Jewish people. Attempts to unify the “Body of Christ” or “believers” [in Jesus] in a common, Israel-focused crusade. This unification and reconciliation theme has surfaced in the past, but has always been somewhat surreptitious, with Israel’s leaders either ignoring the undercurrents or simply being duped. For example, in August 2007, Rabbi Benny Elon, former MK, Minister of Tourism and Chairman of the Knesset Christian Allies Caucus (KCAC), inadvertently found himself being asked to bless a messianic revival conference in Jerusalem, sponsored by Pastor Jack Hayford. It is worth noting that Israel’s Ministry of Tourism has had no problem using a renowned missionary such as Hayford as their poster boy. More recently, in October 2014 JewishIsrael reported on an attempt by Dr. Raleigh Washington of Promise Keepers Ministry to team up with messianic pastor/rabbi Jonathan Cahn and the Messianic Jewish Alliance of America (MJAA) in a One Message campaign of unity with messianic leaders in Israel. The movement’s mega event, under the banner “Jesus Reigns”, was to take place outside Jerusalem’s Old City Walls, but had to be postponed when a major sponsor reportedly backed down. Past and present CUFI executive board members and directors are openly joining with their messianic brothers and sisters and jumping on the “to the Jew first” bandwagon. We see the same new openness from Christian Zionist organizations such as the International Christian Embassy Jerusalem (ICEJ). In the past the ICEJ consistently tried to modulate their indisputable associations with those who target Jews for conversion in Israel. However, since the departure of former ICEJ director Malcolm Hedding, there seems to have been a policy change with ICEJ directorsJurgen Buhler, Juha Ketola and David Parsons, who all openly collaborate with messianic missionary leaders in Israel. This was especially evident at the ICEJ’s 2014 Feast of the Tabernacles and at Robert Stearns’ Day of Prayer for the Peace of Jerusalem which took place last October. Messianic leaders are now an integral part, if not the main feature, of ICEJ’s Envision Pastors and Leaders Conferences. The current transparency and zeal of these evangelical organizations striving to bring Jews to Jesus in Israel, should be of concern to all Jewish Israelis. However, the Israeli government is not in a position to stop such events, because the US State Department considers such censure a violation of International Religious Freedoms legislation. Over the last 40 years, Israel has become dependent on the Christian tourism industry, Christian Zionist US Congressional support and evangelical-led hasbara efforts. All of this makes it difficult to protest what amounts to a “Jesus revolution” in Israel. That JIJ has expressed extreme views against Orthodox Jewish groups and has an overt pro-messianic Christian agenda and that partners Decker and Myers are regularly featured keynote speakers at events which aspire to bring faith in Jesus to the Jews, apparently poses no ethical issue or conflict of interest for the US State Department. Don’t let a mere half of Calev Myers’ face on the ICEJ Envision 2015 promotional banner fool you. The ICEJ is openly and fully networking and cooperating with Israel’s messianic leadership, who are committed to bringing thegospel to the Jews and gaining a Christian foothold in Israel. ICEJ’s Envision Pastors and Leaders Conference for 2015 was held last week, from January 26 to 29, 2015. The conference presented itself as an opportunity for evangelical leaders to network with messianic missionary leaders in Israel. For example, the opening day featured Tel Aviv born Avi Mizrachi, Messianic leader of Israel’sDugit Messianic Outreach Center and Adonai Roi Congregation. Mizrachi is a missionary, who enjoys support from Evangelical churches in America, Europe and Asia. He is very public about his agenda and beliefs, actively aspiring for the day when Israel’s entire population will accept and worship Jesus. Mizrachi is also a regularlyfeatured speaker at the ICEJ’s Feast of the Tabernacles, and the ICEJ markets Mizrachi’s teachings. Last year’s ICEJ Envision 2014 conference featured Israeli evangelical messianic leaders Calev Myers, Peter Tsukahira of Haifa’s Or HaCarmel Ministry andWayne Hilsden, Senior Pastor of King of Kings messianic community based in Jerusalem’s Clal Center. At ICEJ’s Envision conference, Hilsden went to great lengths to explain to the audience the success and the strategy behind the rapid expansion of the messianic movement in Israel. Excerpts of his presentation can and should be watched here. There is no longer any doubt that the ICEJ is actively involved in and dedicating great resources towards establishing and growing an active and strong Jesus-believing community of “Jews” in Israel. It is disturbing, but no longer surprising to see a formidable team of Israeli messianic leaders such as Calev Myers and Wayne Hilsdon featured alongside Jonathan Bernis,Jack Hayford and Michael Brown. But what should really raise Jewish eyebrows is the participation of CUFI executive board member Pastor George Morrison. Morrison also serves as a regional director for CUFI. While it is not unusual for those who are serving or have served as CUFI leaders, such asStephen Strang, Robert Stearns, James Hutchens, Keith Butler and Michael Little, to support messianic missionaries and their endeavors in Israel and abroad, this may be the first time that an active CUFI director has lent his name and services to a major high-profile evangelical conference focused on spreading the gospel to the Jews and building Israel’s messianic community. Once again, this conference will feature as speakers Christian Zionist leaders such as former CUFI directors Robert Stearns and Stephen Strang, and ICEJ’s Jurgen Buhler, alongside Israeli messianic Christian missionary leadersWayne Hilden, Avi Mizrachi, Marcel Rebiai and Tom Hess. “Witness. Knowing the time is short, we in Jerusalem need to witness while we can. Yeshua communicated the good news using physical things in this city as tangible illustrations. Of additional concern is the participation of powerful and aggressive evangelical leaders and organizations who have continuously dedicated major resources to converting Jews and who preach a conversionary agenda. These include Morris Cerullo, TBN Russia’s Igor Nikitin, E.A (Enoch) Adeboye , Convoy of Hope and “Assemblies of God”. More than “reconciliation”, the emphasis of these conferences should perhaps be “reunion”, as many of the missionaries involved in planting churches and “messianic” congregations in Israel were sent on their missions by such entities as the “Assemblies of God” and “Christ for the Nations” (CFNI), both of which are partnering on behalf of Empowered21 Jerusalem. For example, CFNI, based in Dallas, has a significant circle of missionary family and alumni operating in Israel,among them Ari and Shira Sorko Ram of Maoz Ministries, Shani Ferguson of Yeshua Israel, Avi Mizrachi of Dugit,Peter and Rita Tsukahira of Kehilat HaCarmel and Ray and Sharon Sanders of Christians Friends of Israel (CFI). Sponsors for the Empowered21 Jerusalem 2015 Global Congress include established Christian Zionist organizations such as ICEJ, Bridges for Peace, The Christian Broadcasting Network (CBN), Charisma Magazineand Christian Friends of Yad Vashem. Sar El Tours is a very popular messianic-run tourism company in Israel. Sar El is a sponsor and by some accounts“the official appointed tour operators for the Empowered21 Global Congress in Israel”. Sar-El Tours is owned and operated by Samuel Smadja, an Israeli messianic pastor. Smadja can be heard at the 1.34 mark of this videoexplaining his agenda and why it is so difficult for the Jewish mind to accept jesus as the son of god. Smadja’s father, Victor, who recently died, was coined as “the Father of 20th Century Messianic Judaism” byCharisma Magazine, a publication founded by former CUFI regional director Stephen Strang. The fourth and final conference covered in this report is the 10th International Conference of the Lausanne Consultation on Jewish Ev… (LCJE). It is scheduled to be held in Jerusalem from August 16 to 21, 2015. With a title like that, no in-depth explanation is needed as to the agenda. Suffice it to say that LCJE is a “special interest committee” of the highly influential Lausanne Movement, and closely affiliated with Jews for Jesus and Chosen People Ministries. Most Christian Zionist organizations still do their best to avoid LCJE’s in-your-face-convert-the-Jews gatherings. However the same cannot be said for Pastor Wayne Hilsden of KKCJ and previously mentioned Israeli Evangelical Attorneys Calev Myers and Michel Decker of JIJ, who have lent their expertise to LCJE conferences in the past. Worth noting is that a number of “pro-Israel” evangelical and messianic organizations are recently reeling after theLausanne Committee for World Evangelization took a swipe at Christian Zionism, by publishing a piece in their publication, “Lausanne Global Analysis” which reportedly asserts that Christian Zionism has a “very narrow theological narrative.” and was ” ill conceived”. That Jerusalem will be making preparations to host a conference that is openly focused on eradicating Judaism is beyond the pale and most certainly pushes the “religious freedoms” envelope over the edge. As pointed out in a number of earlier JewishIsrael reports, it is highly problematic when Jewish activists and leadership empower missionary organizations by partnering with them. Yet for years Eliezer Braun of Shuva Israel (www.blessingisrael.com) has engaged in fundraising and “spiritual bridge-building” with Resurrection Fellowship (REZ), the sponsors of the Israel Summit Stand Firm missionary conference cited earlier in this report. REZ has a number of missionaries operating in Israel. World Jewish Congress President Ron Lauder had the very best intentions when he spoke and signed a letter against the persecution of Christians at the hands of Muslims at the October 2014 ICEJ Feast of the Tabernacles. Yet now he can find himself literally on the same page as those actively working to evangelize in Israel as a part of the Empowered21 Jerusalem 2015 Global Congress. That very same Empowered21 article spells out their agenda for every person to know jesus christ, announcing their upcoming Jerusalem Global Congress to that effect. All this a mere two sentences after citing Ron Lauder’s commitment as a Jew to speak out on behalf of Christians. But perhaps the most stunning example of the abyss to which Jewish leadership has led us is best illustrated by charting the meteoric rise and acceptance into Israeli society of influential Christian missionary Joel Rosenberg. Rosenberg is someone who partners with and promotes the most aggressive organizations targeting Jews for conversion. Four months later in August 2014, Joel Rosenberg announces that he and his family will be making Aliyah to Israel as Christians. On January 1, 2015 JewishIsrael was forwarded a mobile message of Joel Rosenberg reporting on his lunch with former Deputy Foreign Minister and Israel’s Ambassador to the United States, Daniel Ayalon and his wife Anne. It has come to the point where Jewish leadership might consider tearing kriyah and reciting al-chet over its active and direct role in ushering these Christian “friends” into our midst and facilitating our “friends” long-time aim to spiritually destroy us, heaven forbid. Tragically, it is far easier and much less painful for our politicians, rabbis and leaders to “turn the other cheek”, dismiss the facts and view this incursion as evidence of a new and “prophetic” era of Christian “love”.